worker man has a new obsession. worker man spent time researching them all online and then we went to the lego store in a nearby mall. 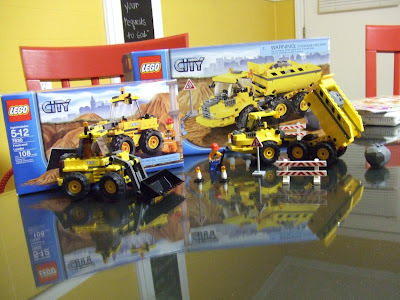 he asked one of the ladies who worked there about which construction set he should get. her question: well, how old is the kid you are wanting to get one for? when i told him that this little hobby of his might be a waste of money he questioned how many bags/purses i've bought since we've been married. but that's over t-h-i-r-t-e-e-n months. and trying to get a third. this might get out of hand really fast. I am laughing out loud. Umm....28!!!!!!!!!!!!! this has nothing to do with worker man (sorry, J... props for the new hobby) but i just wanted to let you know that i got up and made muffins out of the package this morning and thought that if you'd been there too, i would have only gotten 2 instead of the 6 it was supposed to make. i did lick the spatula for you though. In the grand scheme of things.... this is actually precious so count your blessings and go buy yourself a new pocketbook! PLUS now I know what to put in his goody box for Christmas.... :) and when there are 5 little rowdy boys running around....he will already have a collection they can admire, search and destroy!! Now I want to do some Legos. Tell Worker Man I said thanks for the idea!